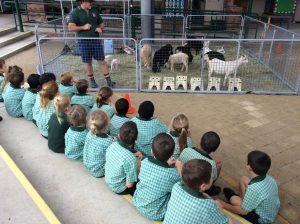 The sound of excited children and the bleating of ‘kids’ was heard loud and clear before classes started on Thursday April 14. As students, parents and siblings arrived to school this day, they were greeted with a bleat a cluck and a snort! Under the covered area of the Junior primary school stood a fenced-off area slowly being filled with all kinds of baby animals! As the term continues the students will draw upon this experience for their learning in both reading and writing.